Galeria Krakowska organised an International Mural Competition for one of the largest murals in Poland. Both Polish and foreign street artists will have at their disposition over 1,400 sq. m. of surface area. 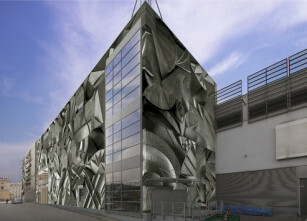 The task will be to paint a mural on the elevation of Galeria Krakowska facing the railway station. This kind of marriage of a commercial place and street art is a novelty in Poland and in Europe as well. It is the gallery which has inspired this artistic project. Thanks to the mural, the city will acquire a modern image and a unique example of art in public space. The façade of Galeria Krakowska will become a huge canvas which will enrich the city space filling it out with a large-format painting. More than 500 designs were sumbitted from all over the world. The winner, Justyna Posiecz-Polkowska from Poland, was selected by the competition jury composed of a number of recognised personages from the art world. The awarded design will be executed in May 2013. The prize founded by Galeria Krakowska is 20,000 Polish Zlotys.The costs associated with creating the mural shall be also covered by Galeria Krakowska.